I believe that the most serious problem in S A today is the shortage of jobs. Unemployment figures for the 18 to 35 year old bracket is way over 60% and climbing !! This is an extremely explosive situation and we all should try to do our bit to alleviate the problem. It is therefore quite frustrating to work in an environment where tourism jobs are actively discouraged. For many years Viva Safaris has had reason, by virtue of sustained tourist demand, to increase the number of chalets at Tremisana Lodge. We have been restricted in building additional guest chalets by committees that have decided that Tremisana is big enough. Recently a new lodge application by a tried and trusted lodge operator in the same reserve has been stonewalled. It is scary to know that committees are able to push their own selfish agenda to the detriment of our country ! We need enlightened and unselfish leadership to defuse the unemployment time bomb ! Vehicles with many tourists = more employment opportunities for locals. I recently visited the Hluhluwe-Imfolozi Game Reserve some 2 hours drive from my home town, Durban. A drop in tourism will directly affect employment in our region. It has been an interesting month with multiple sightings. Some drives have been quiet with only impala and birds whereas other drives surprise us with extraordinary encounters. The Bush is very lush and green and therefore very dense and difficult to see through. All the food and water allows for the wildlife to be flourishing. Normal routes used in the area where we conduct our walks tend to have vast amounts of long grass perfect for grazing animals. We have had signs of buffalo crossing through the area from the Olifants River. We view the hippos in their pods relaxing in the water. All in all a good experience. Have been absolutely amazing! From lions to rhino as well as elephants. A beautiful sunrise, sightings of all sorts including general game such as giraffe and zebra as well as hippo! 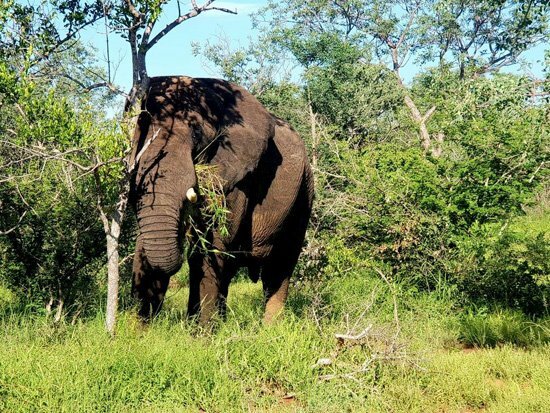 Big Tusker under a big tree. Great sightings of hippo, lion, elephant and rhino. Giraffe, zebra and kudu have also been seen occasionally on these drives with a load of bird species. Have been a mixture of quiet drives and busy drives varying throughout the month. It has included seeing the Big Five. I would like to thank Viva Safaris for the opportunity given me. It is difficult to find a job, let alone one with such a successful company. I have enjoyed my first month at Tremisana Lodge very much. I love the bush and the scenery as well. I am thankful for all the rain that has made the bush so lush and green. Working with the guests is amazing. Being able to show them the beautiful wildlife we have is such fun ! Giving them additional information on plants, tracks and birds gives me great joy. I saw a wide variety of game on my drives. Elephants are my favourite and seeing them on a daily basis is wonderful. 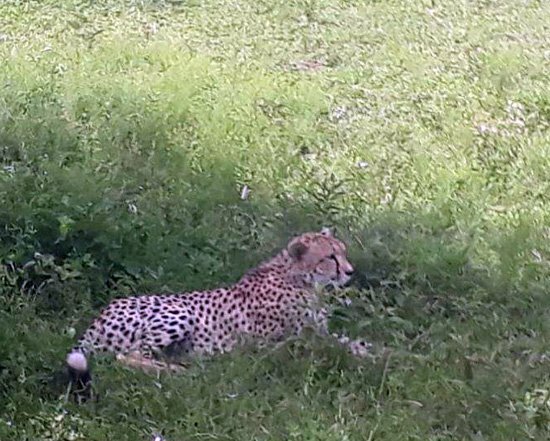 I also have been lucky to see cheetah, African wildcat, buffalo, black rhinos and lions. 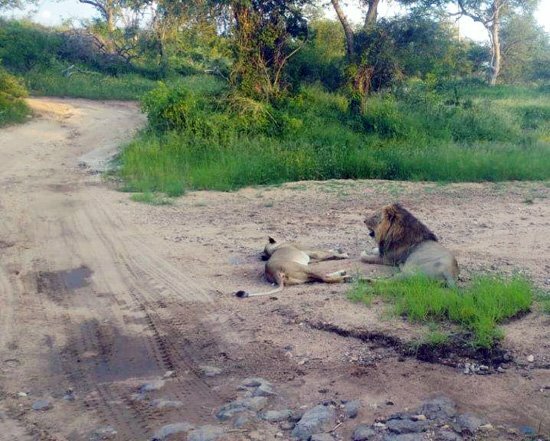 One night driving back from Marula Boma my quests and I were lucky to see lions with a beautiful male roaring next to the vehicle and four lionesses walking with eleven cubs in front of my cruiser. I saw my first honey badger in the wild – something I always wanted to experience. Lion pair near Marula Boma. I really look forward to the months to come. Bush walks have always yielded hippos, giraffe impala and waterbuck. On some game drives we have seen both Black and White Rhino ! On one Sundowner drive we got 6 black rhino ! Black Rhino near the open vehicle. Lions have been fairly common and the sightings have been good. A lot of sightings were on the road as the lions get away from ticks in the grass. I am glad to be back in the saddle – oops seat. The highlight of my month was on a Sundowner drive when we decided to climb up a huge rock on Rome 1. A herd of Giraffes was approaching us from a distance and we were all holding our breath to see what they were planning on doing. Nine very beautiful giraffes walked very gracefully past the rock and we were so high up that we could look them in the eye. The guests were in total awe of this wonderful sighting. Sundowners on the rock from where we had spiritual encounter with a giraffe herd. Guests also love the sunset drives and we were fortunate enough to see a herd of 15 elephant, including very young ones. There were buffalo along Olifants River as well as 2 black rhino very close to Tremisana Lodge. Of course the Impala are everywhere and although we saw many the guests still enjoyed the sightings because some of them had only seen pictures and not in real life. On one of the morning bushwalks we came across 6 Hyenas eating an impala. From the tracks around it looked like it was killed by a leopard and then the hyenas stole it from the leopard. One day on an afternoon drive after seeing nothing but Impala, on the way back to the lodge, out of the blue a big male lion and female were lying in the middle of the road! What a sighting ! The guests loved it. Overall the drives were all fun and full of excitement! Happy guests…..Happy guide……! A day in Kruger : It was a very warm day between 20 to 34 degrees celsius. From the boom gate to the reception, we saw general game including zebras, wildebeest and giraffes. We took the H7 and just before the Marula turnoff we saw a cheetah next to the road. Further on, we got a big male lion crossing the road near Kingfisherspruit. At Nsemani Dam we saw an elephant herd drinking water. After lunch we took the H1-3 to Kumana dam where we saw a male leopard lying under a tree. On the S36 we saw a large buffalo herd crossing the road near Rockvale waterhole. 3rd: Kruger started hot but at end of the day windy and raining. Lions on Rabelais, two buffalo bulls on s106 road, white rhino on s36, plenty elephants Sweni road. 9th: Lions on h6 road, elephants s100, cheetahs s36, loads of general game Sweni and Muzandzeni. 14th : LIons s12 waterhole Girivana, elephants and plenty general game s40,lions again Nyamari waterhole on h1-4 after ngotso dam, leopard on new road 147 road lying down with a young cub. 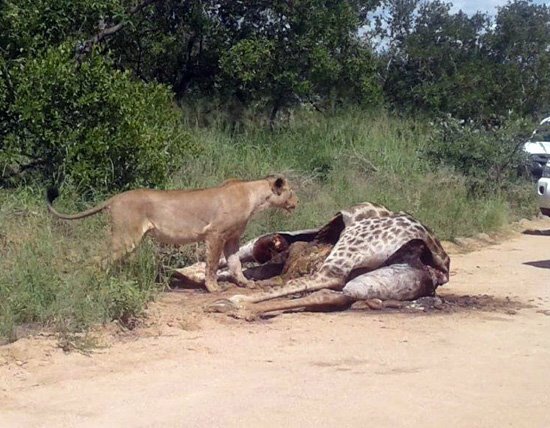 19th : Lions eating giraffe on s36 after Nhlanguleni picnic spot, plenty elephants and buffaloes on s34 road to Tshokwane, white rhino between Mazithi and Kumana dams. Great shot of mom and baby. 26th : Lions s40 road, elephants Nsemane dam, buffaloes s106 Rabelais road, three white rhinos before Orpen camp, one cheetah crossing the road at Tamboti camp junction. 27th : Elephants Girivana waterhole, plenty general game h1-3 to Kumana dam, leopard on sausage tree close to the road, plenty game on s125 road, lots of buffaloes at Rockvale on s36. I did my Bush walk and it was quiet but we showed our clients the hippos and crocodiles along the Olifants River. Some of my guests were very afraid of the hippos as they had read how dangerous they can be. At the end they started to understand after I explained their behaviour and they calmed down a bit ! On a Sunset drive, I used Marula road and we saw lots of impalas, kudu and one bull elephant that was on musth. He came close to us but the reaction was good my guests and I enjoyed him without running. Nature will surprise you because a lot of people think that the bull elephant will knock you but he didn’t do anything as long as you respect him. 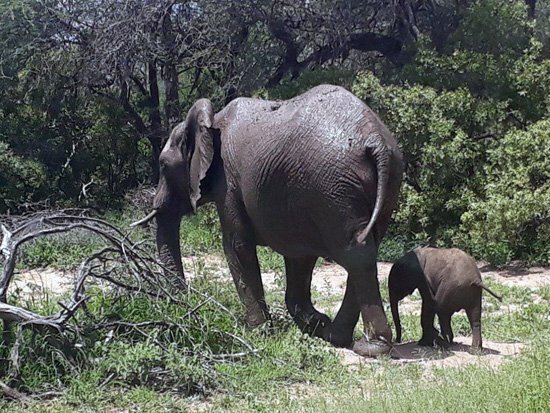 Then we drove on Sable road and saw giraffes and just when we reached the world-famous Marula Boma we came across a breeding herd of elephants – it was amazing to see the baby elephants. While we were at the Boma the hyenas came there so we had a great time – Hakuna Matata. 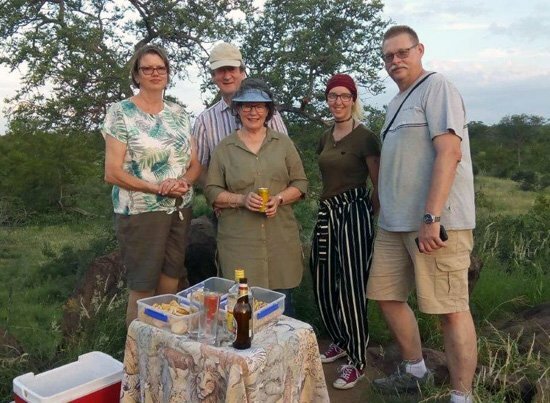 I went out with my guests on an Afternoon drive – it was quiet but we saw the hippos on Campfire and giraffe then I went on Barnard and we saw other hippos. I’m saying this because people like only the big five. Nature will always surprise you – full of surprises and full of disappointments – it’s a game that’s why we call it a game drive – Halala. 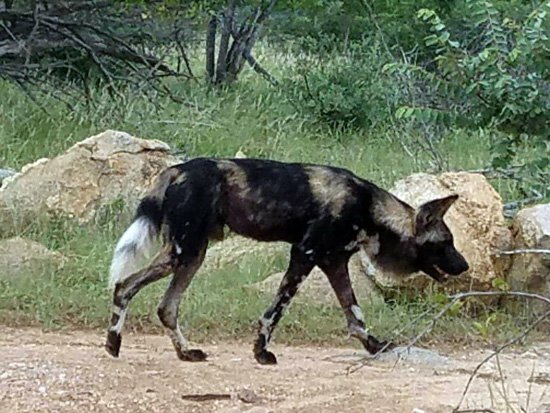 On another day, we got a Wild Dog near Tremisana Lodge. Wild Dog near Tremisana Lodge. 1st : Afternoon drive we found a pride of lions at the Nonwane cut line – sixteen of them including two big males and eleven cubs very close to the road . At Campfire we found four black rhino drinking water while the hippos were watching them. Just a little further on north of the dam we found male and female lion mating. Fantastic Drive ! 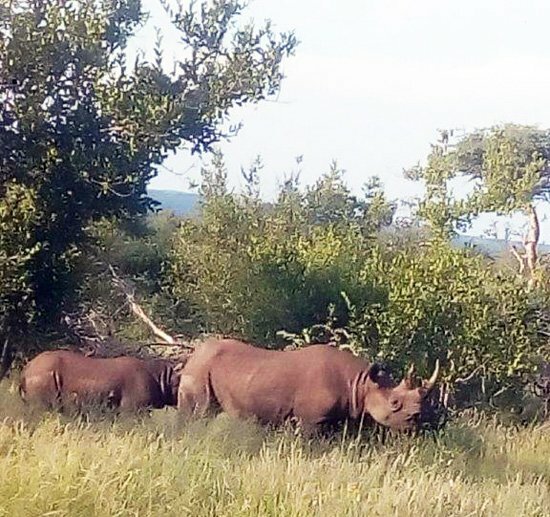 4th : We found three black rhino – two were mating very close to the road near the open area. 8th : Five hundred metres from Tremisana lodge we found a female leopard trying to catch a warthog. At Naledi entrance we found two females and one male lion lying down. Later on they walked to the river bed passing right next to my vehicle. On Marula extension we found a big bull elephant in musth coming straight to us in a slow charge. When he got closer, he gave way and went into the bush. At Rome 1, we found white rhino. What a lucky drive : four of the big five. 21st : On S36 in Kruger about 6km from Nhlanguleni picnic spot found two female lions on a giraffe kill – there was lots of vultures as well. Lioness with giraffe kill on the road. 23rd : At Kingfisherspruit junction we found three cheetah trying to catch an Impala. A giraffe warned them and they saw all started to alarm call and then the cheetahs gave up and took another direction. About 4km from there we found 11 lions with cubs. Riana has worked wonders in her first month as manager. The productivity of all staff has improved. Gone are the days that the staff went down a gear as Sandra and I bade their smiling faces goodbye until the following month. We are both thrilled to know that the work ethic is excellent. 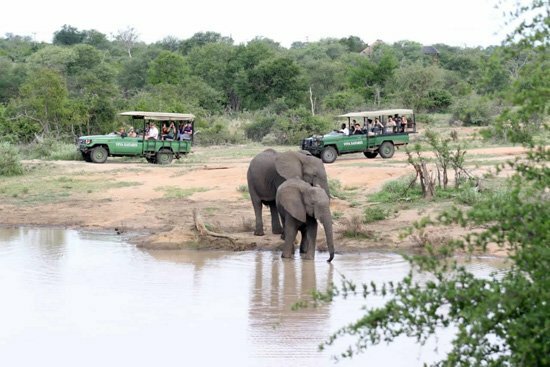 Game viewing has been average as there is plenty of water all over the reserve. The monkeys and warthogs have introduced their youngsters to Tremisana and they are already quite tame and used to admiring tourists. We have had fewer guests than Marcs or Tremisana and the Katekani staff have assisted at these camps when there were no guests. There is a new Kudu bull with magnificent horns – probably jumped the Kapama fence – and the bushbuck have had their young. 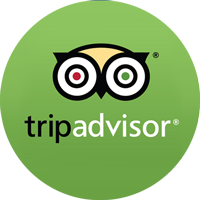 We congratulate our new hostess, Collette, on setting a new record number of Tripadvisor reviews in one month for any camp. Well done ! Our guests clearly love your attention and care ! The nyala are all over the camp and the newborn foals are as tame as their parents. The Klaserie Dam is over 100% full after copious rains and the Klaserie River is flowing strongly through Marc’s Treehouse Lodge property. We have procured reeds ( it was a more difficult process than we expected ) and we have fixed any areas that needed a “patch-up” as Camp Manager, Charl, puts it. 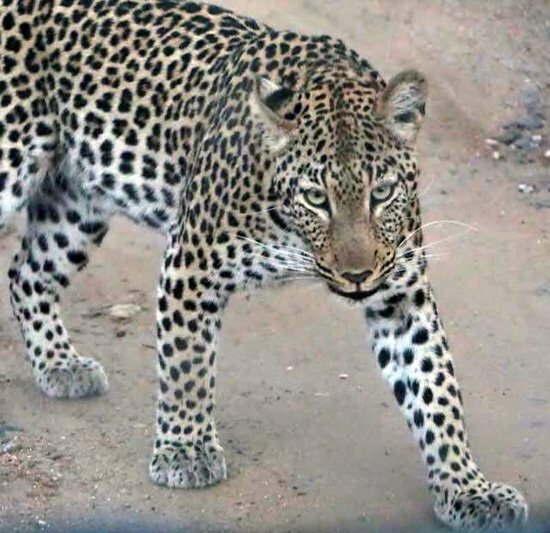 A new young female leopard has been seen very often between Masango camp and the main reception area. Young female leopard seen at Marc’s. We have had another reasonably good month. I hear stories about some tour operators folding and some 5 star lodges sending staff home because there are no guests. I am told reliably that there has been a drop this year of over 30% in most tour operations serving Kruger Park. Thankfully Viva Safaris has been able to buck the trend and figures for the first two months of this year have been pleasing. The fact that we were able to employ 3 new members of staff this month speaks for itself. As per my opening comments of this newsletter, we are all very proud that we are doing our bit to alleviate the terrible unemployment crisis. We spent one night in the Tremisana lodge and four nights in the treehouses and were exceedingly happy with all aspects of the visit. The accommodations were clean and comfortable, the food always delicious, the bar well supplied and affordable. The rangers were very professional and knowledgeable and really tried hard to find as many animals as possible. The bush walks interesting and what could be better than waking to the sound of a lion announcing his presence? Collette went out of her way to make everyone feel at home and to make it feel as though we were a family. She even helped arrange a birthday party for one of our fellow campers. I can’t think of anything to improve upon. Just wish we had had more time. Our experience here was great (despite the power being out but hey you’re in the African bush – live a little). Staff was welcoming and friendly, special shout out to Pretty who really took time to make each guest feel at ease and welcomed. Such a precious person and a real asset to the lodge. Our game drives with Bernard were really good, he really made an effort to make the whole experience interesting and did a great job. Overall a great experience and would recommend. The trip of a lifetime. Don’t let the word “tent” scare you. You are in comfortable air conditioned tents. Our hosts Margaret & Pretty were there for us for anything we needed. Always with a bright smile. Our cook Tiger made us fabulous meals and delicious desserts. The Safari had guides named Smylie, Harryson, & Jordan and they were top notch. The guides not only tracked the animals for us they gave a history lesson about the vegetation. I’d be remiss if I didn’t mention our drivers. They spent a lot of time with us and always engaged us with great conversation. Want some negatives…SORRY I don’t have any! I don’t usually write reviews but this was exceptional and deserves the review. I did a 4 day and 3 night tour with Viva Safaris to Kruger National Park. I travel very often for leisure and this was the best tour that I have ever been on. Collette was a fun and helpful host at Marc’s Camp. Victor took my group on our park safari day & also a bush walk – he was very informative, has a great sense of humour, and is always smiling. I am very thankful that I got to have this experience & will recommend it to anyone who visits South Africa.